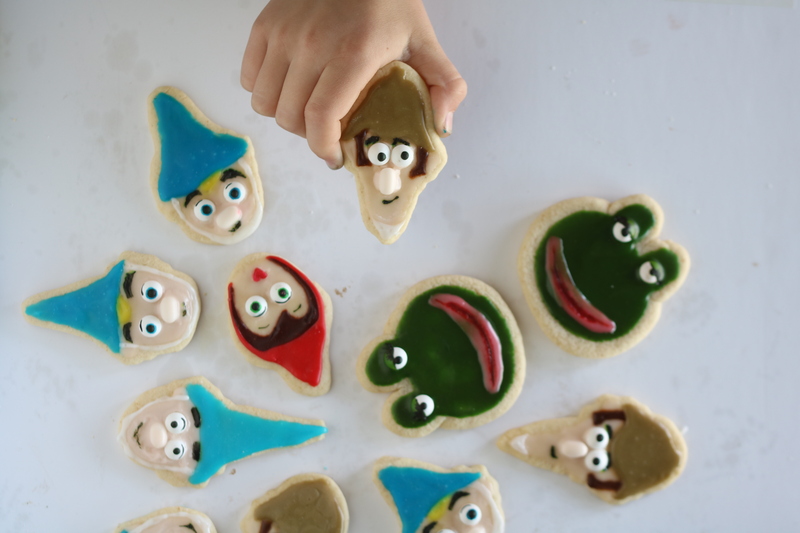 This easy decorated gnome sugar cookies post is sponsored by Paramount Pictures. As always, opinions are our very own. 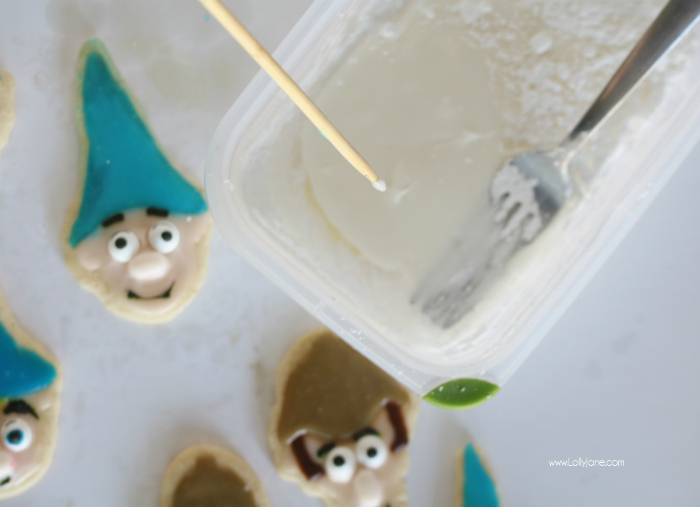 First timer here decorating sugar cookies with royal icing and these easy gnome cookies turned out so cute! 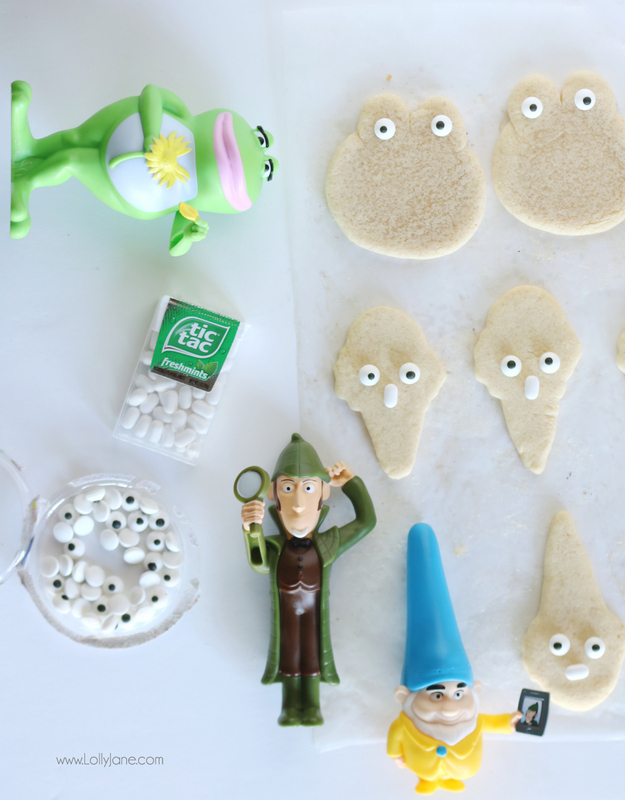 Follow along with this simple step-by-step tutorial to decorate your own Gnome cookies, perfect for a woodland themed party! 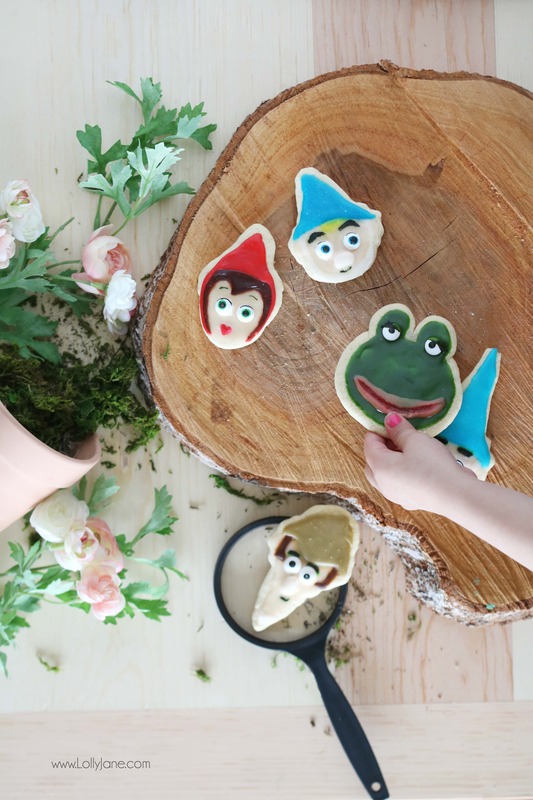 These gnome cookies were easy to bake and even more fun to decorate. 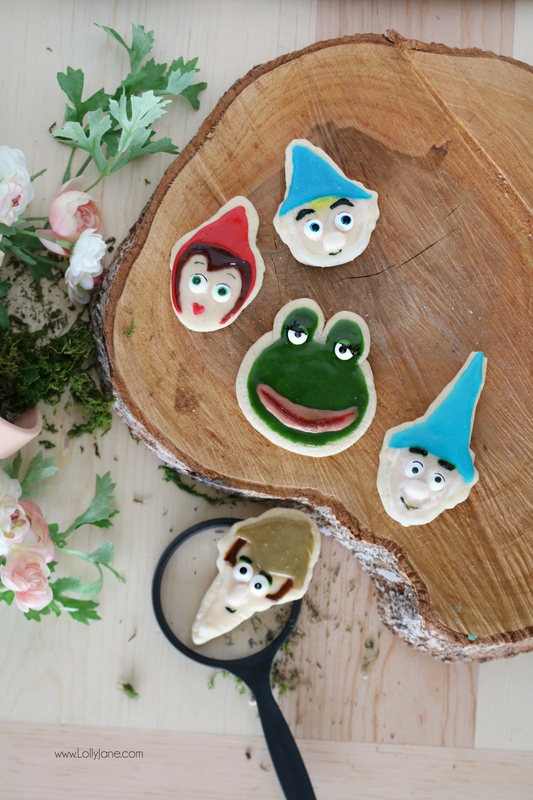 Munch on them while you re-watch Gnomeo & Juliet in preparation for Sherlock Gnomes making its debut in theaters on March 23rd. Our favorite gnome couple is back, this time with the help of legendary detective Sherlock Gnomes. After a string of garden gnome disappearances in London, Gnomeo & Juliet enlist Sherlock to solve the case of their missing friends and family. My kids and I loved Gnomeo and Juliet so we can hardly wait for this cute sequel and to see if Gnomeo, Juliet, Sherlock, Benny, Nanette, and even those silly goons find their missing friends! Step 2. Make an XL batch of royal icing frosting, (use your favorite recipe.) Separate into 9 small containers. Step 3. Mix food dye in 5 containers to make alllllll the colors of gnomes! I used colors based off the characters from Sherlock Gnomes but you can use whatever colors you prefer. The colors I used were: red, green, olive green (brown + green,) brown, yellow, pink, blue, and pink + yellow for flesh tone. I left some unmixed icing (white) for the gnomes beards. Step 3: Fill sandwich baggie with icing hue of choice then use it to pipe the gnome hat on top of the cookie first, fill in with toothpick or in my case, a skewer. LOL! 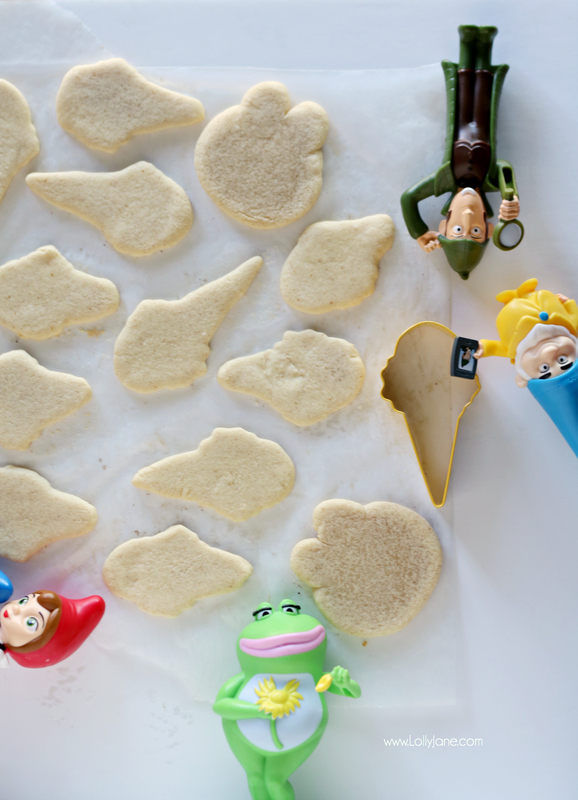 (I love these cookies because no fancy tools needed, very kid friendly.) Anyway, let dry for 5-1o minutes or until icing has glazed over. Step 4. 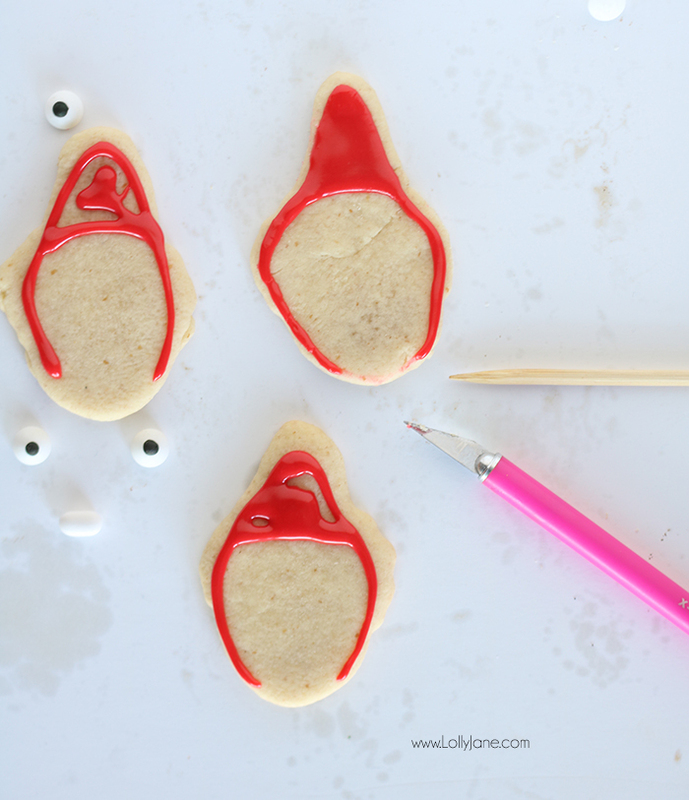 Add hair (optional) then fill in the remainder of the cookie with flesh colored icing. Set tic tac as nose and pipe matching flesh colored icing over it completely. Step 5. Now to decorate! Dab a bit of icing on the back of the edible candy eyes then place on gnome cookie where appropriate. 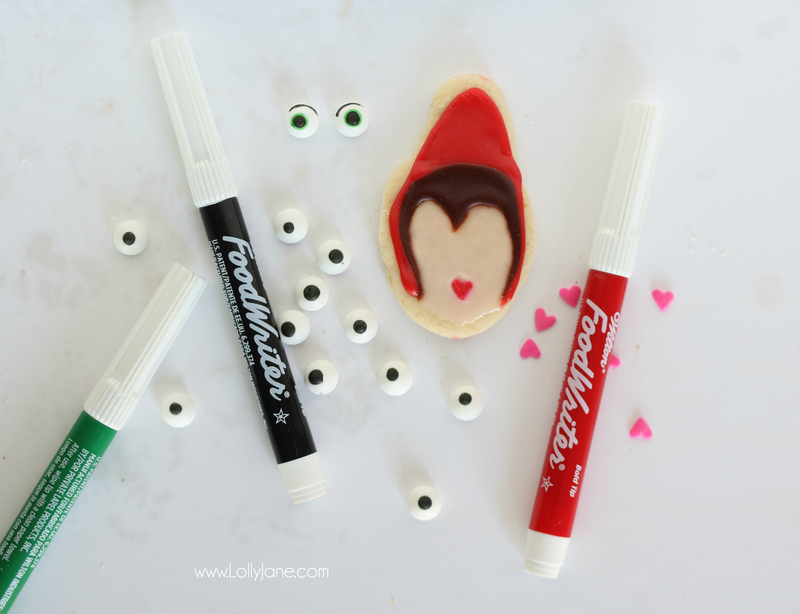 For Juliet, use edible marker and color over a red heart sprinkle to use as mouth and add some icing to the back and set under eyes, (or draw mouth on with marker.) 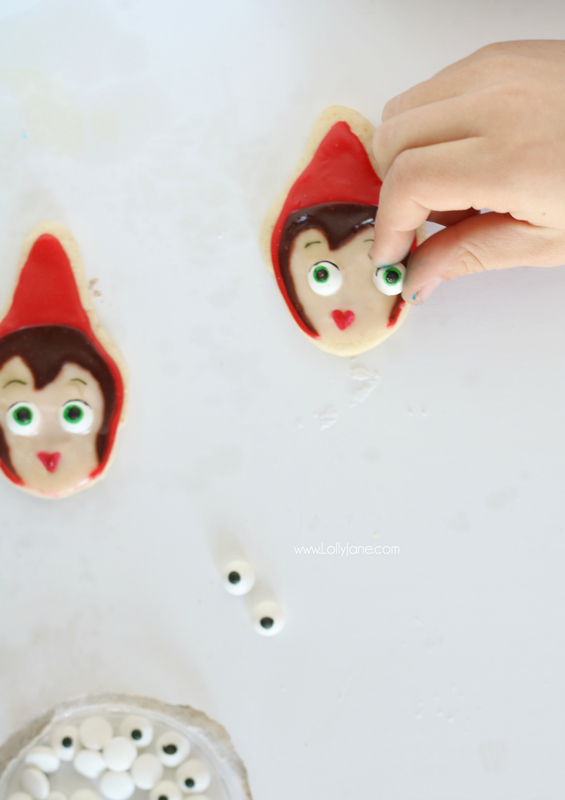 If you want your gnome to have colored eyes, trace circle around candy eye pupils with edible marker- easy peasy! 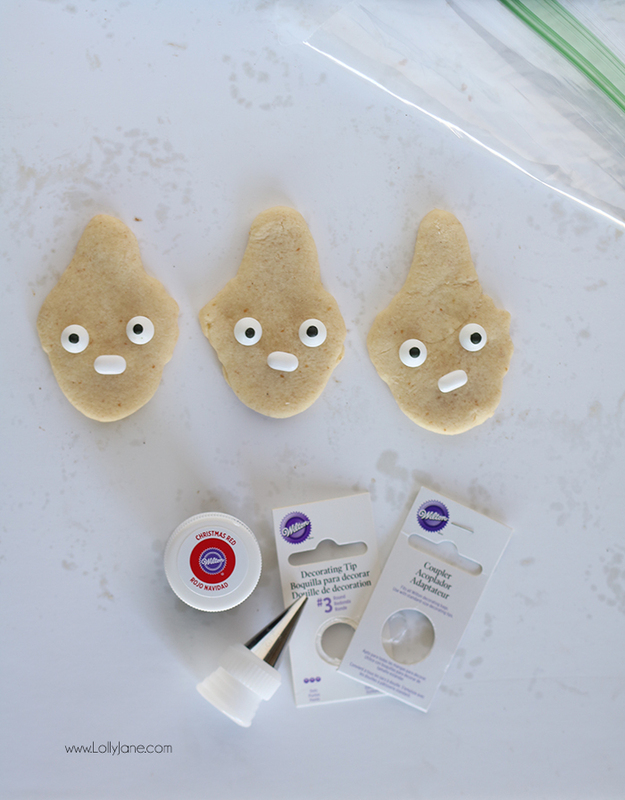 For Nanette, simply frost entire cookie green then add eyes, (use icing to cover part of the eyes as shown,) then pipe pink mouth. Optional, use edible marker to draw on eyes once icing has set completely. Step 6. Let icing dry for several hours then draw on eyebrows and mouth with black edible marker. Step 7. 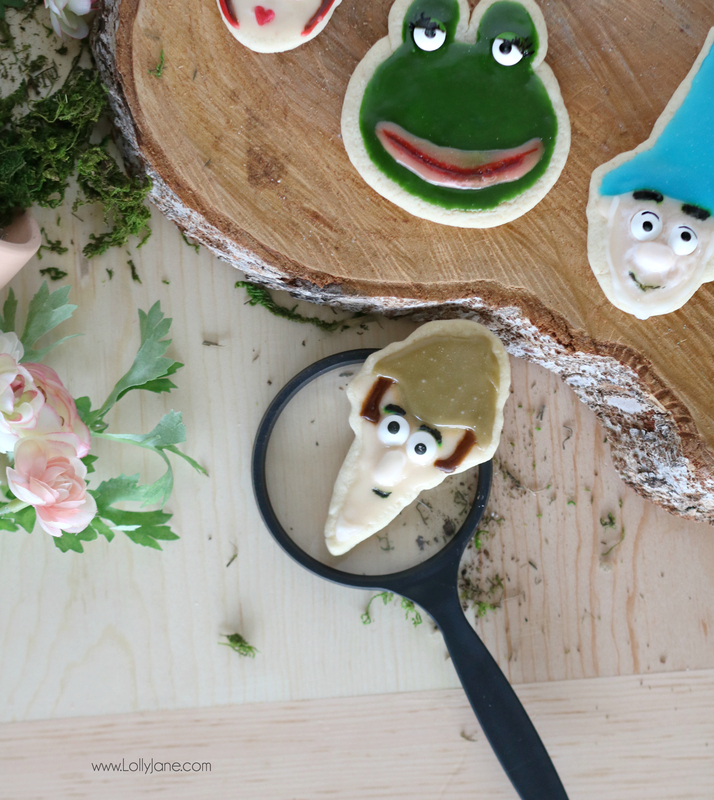 Store your cookies (in the fridge for 2-3 days or freezer for 1 week) and enjoy at the movie theater with your family on March 23rd while watching your favorite Sherlock Gnomes characters come to life! You can keep up with Sherlock Gnomes in the meantime! 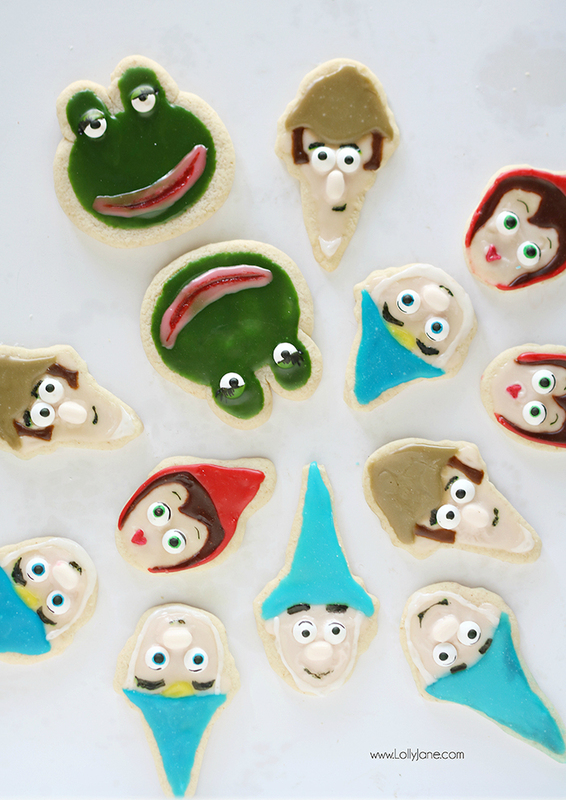 What fun cookies!! 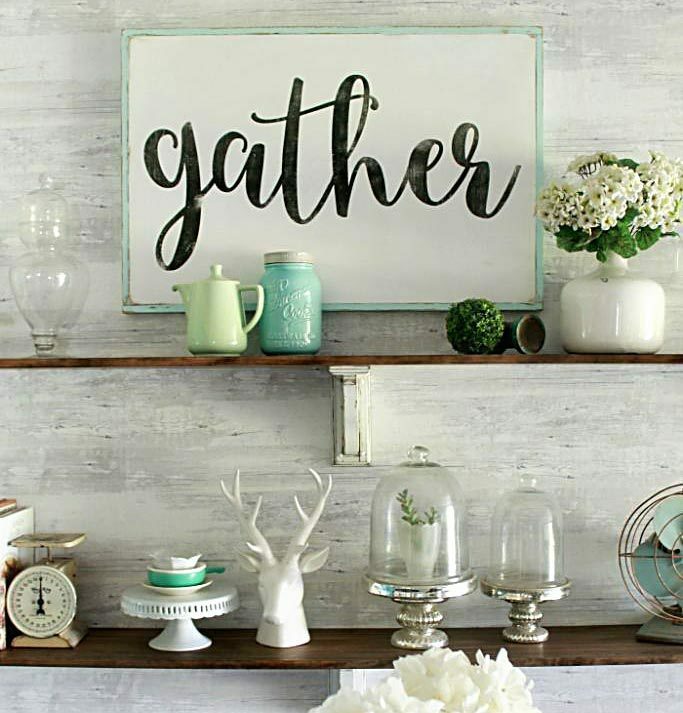 Great instructions – Thanks for sharing at the What’s for Dinner party!